Business Doctors is the recent fiction I just finished reading. The title wasn't giving away much- is it a fiction or it is a corporate book or something related to medicine. But a quick read of its description is sure to get you interested. 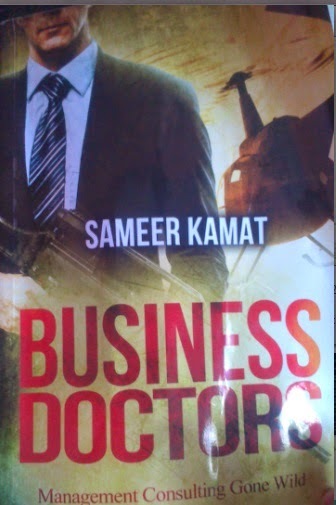 Written by Sameer Kant, Business Doctors is a fiction where a corporate consultant was pulled into a consulting assignment with an underground gang, which was involved in all the business that are not legal. The don's underground empire was fast crumbling and he is desperate to revive it. Based on his wife's suggestion, underworld don engages services of a corporate consulting firm to identify a way out of crisis. For Michael Schneider, who is running his own consulting firm, economic slowdown has brought his revenues to near standstill. The underworld don's consulting assignment is a way to keep cash registers ringing. He gets started with an intention of keeping his part of the work legal and brief, but as the story progresses, things get bigger and his involvement more deeper. Do read the book to enjoy the finer details. Book has good narrations on cultural differences between how a corporate company operates vs a bunch of criminals operate. What I find missing in the plot is the action from law enforcement. When convicts escape from prison, law enforcement keeps close watch on their family and friends, as escaped prisoners try to contract their loved ones sooner or later. Schneider arranged one man to meet his family. A parallel plot from a Law Enforcement perspective could have made the book more action packed and exciting. But the plot is focused largely on management consulting and the don's underworld business, hence it comes out more as a strategic concept than an action thriller. And mind you, working with underworld teaches lots of lessons not thought in business schools or elsewhere. Also true that lots of business analysis principles used for fixing/growing legal business can be applied to illegal business with equal ease. But then, the whole concept of the book is fairly unique and author has done good job of crafting it. There are many action packed fiction, but the blend of consulting with underworld is relatively new. I started reading it on Saturday morning and was done by Sunday evening. It was a good entertainer. Book is priced at Rs 250. But not much discount is available online. Flipkart sells it at Rs 238 while amazon sells it at MRP. Kindle edition is available for Rs 49. Author Bio: Sameer Kamat is the founder of MBA Crystal Ball and Booksoarus. His first book, Beyond The MBA Hype published by HarperCollins, is currently in the third reprint. Business Doctors - Management Consulting Gone Wild is his second book.